For a very long time, men have been fascinated by the female body. (I’ll give you a moment to get over the shock of that revelation.) I can’t cite scientific studies that have proven that beyond doubt; all I can offer is anecdotal evidence. Go into any art museum — with the exception of the Vatican Pinacoteca — and you’ll see quite a few paintings and sculptures of women who left the house in such a hurry that they forgot to put on clothes. Many of those under-dressed women are identified as Venus: there’s Botticelli’s “Birth of Venus”, a.k.a. Venus on the Half-Shell (1482), “The Venus of Urbino” by Titian (1538), “The Rokeby Venus” by Velázquez (c. 1647), “Venus de Milo”, carved by an unknown artist a century or so B.C.E. There are lots more. By far the oldest Venus is a sculpture usually called “The Venus of Willendorf”, even though she was created many millennia before the mythological deity came to fame as the Goddess of Love. The Venus of Willendorf is really, really old. Now, there are people who can tell you the difference between the Paleolithic Era and the Pleistocene Epoch. They can tell you what period of time those terms describe, give or take ten minutes. Luckily for you, I am not one of those people. “Prehistoric” is close enough for me, although when I’m trying to sound like I know what I’m talking about, I might throw in a fancy term like “Stone Age”. So we’re just going to have to accept the word of experts that the Venus of Willendorf came into existence 20,000 – 25,000 B.C.E. Let me interject that I’ve seen her up close and in person, and she doesn’t look a day over 15,000. She was discovered in 1908 near the Austrian village of Willendorf, and currently resides in Vienna at the Naturhistorisches (Natural History) Museum. The Venus of Willendorf is 4¼” high, roughly the size and shape of a hand grenade. She is on display in her own glass case on an upper floor of the museum. As you look at her, you can’t help wondering (at least, I couldn’t): What did the artist have in mind? Was this just an idle pursuit, something to do with his time while waiting for the invention of Checkers? Was it intended to be a little representation of a goddess; an idol? Or — more likely — was it supposed to be a fertility symbol, possibly used in some sort of ritual? A reason art experts believe the Venus of Willendorf was associated with procreation has to do with her shape, which is, shall we say, robust. When you think about it, the people of 20,000 years ago were on a precursor of the Atkins Diet: very few carbs, lots of Mammoth-kebobs and weeds. What that suggests is that it doesn’t seem likely there would be a lot of “plus-size” gals among roving bands of hunter/gatherers, so the artist wasn’t depicting someone he saw every day. He wasn’t trying to do an anatomically accurate likeness of a model named Ginger or Sophie. 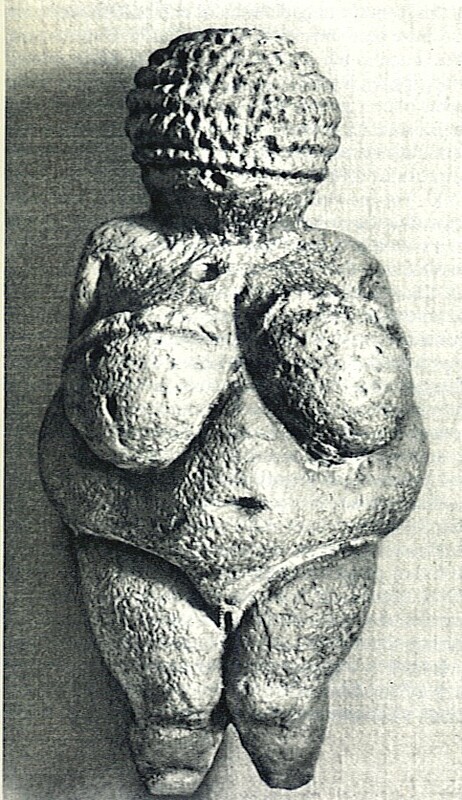 Rather, whoever carved the Venus of Willendorf was doing a sort of abstract work, emphasizing the external parts of a female body involved with fertility: The large belly and breasts are an exaggerated representation of pregnancy. That’s what seems reasonable to me, anyway. And I have to confess, I’m glad to have had my brief encounter with the Venus of Willendorf. Personally, I find older women enchanting.